Products and services we think you shouldn't be without! I'll bet Captain Kirk couldn't do this! Are you getting the right balance of fatty acids? Join live session to see new features from Microsoft that can take hardening your Veeam backup repository to the next level. Learn how to avoid User Account Control issues without disabling UAC. Get the expert recommendations for firewall rules to protect your Veeam backup repository. I use a 45 lb kettlebell for this exercise and do about 20 reps.
Less pushing force is needed using a chair, but hands on chair arms lets you drop your chest deeper for an extra stretch of your pectoral muscles. I usually do 15 of these slowly. I use a 25 lb kettlebell for this exercise and do about 12 reps with each arm. 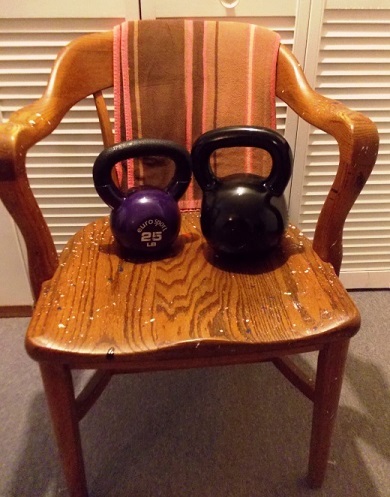 I also lower the kettlebell all the way to the floor for each rep. These can be done almost anywhere and they're great for pumping those triceps! I do these until failure. Now put all four exercises together into a circuit with no break between each exercise. Rest a minute or two after each circuit and repeat 3 or more times. Disclaimer: I am not a certified fitness professional or nutritionist so take any suggestions made here "as is" with a grain of salt and a heaping supply of your own judgment. Please read our full disclaimer at the bottom of this newsletter. Subscriber preferences: As a WServerNews subscriber we're sure you'll enjoy reading FitITproNews each week as much as you enjoy reading WServerNews. But if you'd rather not receive FitITproNews any more, just go to the bottom of this issue and click Update Newsletter Preferences to change your subscription preferences. And by the way, we also have two other TechGenix newsletters you can subscribe to: our Weekly IT Update and Spotlight Articles. Why not subscribe to all of them today? Back up your IBM AIX and Oracle Solaris workloads with new Veeam Agents for IBM AIX and Oracle Solaris. Beta now available. Put your mind at rest with Altaro VM Backup. Excellent performance & powerful features to meet your disaster recovery needs. Download a 30-day trial now for unlimited VMs & get 2 FOREVER FREE VMs! The neat thing is that I can do something similar using the oak chair pictured earlier in this newsletter. If you can find an old wooden office chair somewhere (but not one that has coaster wheels on the bottom!) then try it out! Different types of fatty acids include omega 3, omega 6, and omega 9. Are they all equally important? "The recommended ratio of omega-6 to omega-3 fatty acids in the diet is 4:1 or less. However, the Western diet has a ratio between 10:1 and 50:1." So obviously our normal "unmoderated" Western diet is somewhat out of whack. We're replacing this section of our newsletter with something new in our next issue, so stay tuned! Meanwhile, if you want some good clean fun you could try googling "good clean fun" for videos. No guarantees however that the results displayed will be either good, clean, or fun. 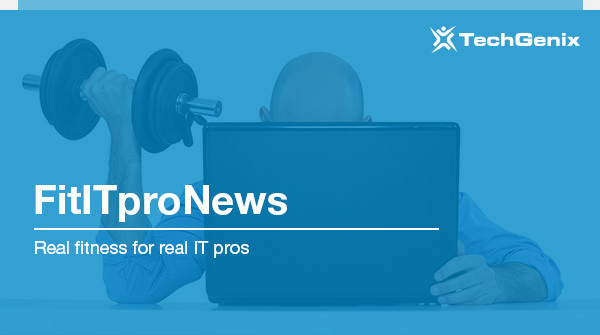 FitITproNews is the only weekly newsletter in the world that is entirely devoted to helping IT pros get fit, lose weight, and live happily ever after as they face the daily stresses and workload of being in the gristmill of the IT profession. FitITproNews is brought to you by TechGenix and is created each week by the same all-star editorial team that brings you WServerNews, the world's longest running IT pro newsletter focusing on the administration, management and security of the Windows Server platform in particular and cloud solutions in general. Subscribe to FitITproNews today! And while you’re at it be sure to also subscribe to our other TechGenix newsletters such as our Weekly IT Update and Spotlight Articles! Mitch Tulloch is Senior Editor of FitITproNews and is a widely recognized expert on Windows Server and cloud technologies. He has written numerous articles and whitepapers and has authored or been series editor of more than 50 books for Microsoft Press. Mitch also successfully made the transition from being a typical "fat IT pro" to becoming fit by losing almost 50 lbs through a combination of resistance training, cardio exercises, and proper nutrition. Mitch's passion with FitITproNews is to help other IT pros do what he has been able to accomplish by sharing his personal story and lessons learned. Ingrid Tulloch is Associate Editor of FitITproNews and was co-author of the Microsoft Encyclopedia of Networking from Microsoft Press. She is also Head of Research for our content development business and has co-developed university-level courses in Information Security Management for a Masters of Business Administration program. Ingrid is also committed to personal fitness and is a believer in clean eating and proper supplementation for optimal health and longevity. Mitch and Ingrid are also the editors of WServerNews, a weekly newsletter from TechGenix that focuses on the administration, management and security of the Windows Server platform in particular and cloud solutions in general. For more information about Mitch and Ingrid see their website. This newsletter is designed for informational purposes only and the health and fitness information presented in it are based solely upon the personal experience of its editors and of any guests or readers who contribute content to it. Nothing in this newsletter is intended to be or should be construed to be professional medical, fitness, or nutritional advice. Always consult a physician or other health care professional before starting an exercise or nutrition program to determine if it is appropriate for your personal needs. Do not follow any of the suggestions in this newsletter if your physician or other health care professional advises against doing so. If you are exercising or dieting or taking supplements and experience any dizziness, faintness, pain, or shortness of breath, you should stop immediately and seek medical help. The use of any information presented in this newsletter is solely at your own risk. Copyright © 2018 TechGenix Ltd., All rights reserved. You can update your preferences or completely unsubscribe from all of our newsletters.